Welcome back to our 72 Hour Emergency Kit series! This week we’re stocking our kits with first aid supplies. Medical supplies can help everything from a blister to a broken arm, and any of you who have seen a crying child cured with a band aid know that medical supplies are an important part of your emergency kit. The great thing about putting together first aid supplies for your emergency kit is that you probably already have a lot of them on hand at your house! 1. Keep your kit as small and portable as possible. You can build a fully stocked first aid kit independent of your 72 hour kit that can be grabbed and taken with you if the emergency dictates a greater need for medical supplies. We want to keep our complete emergency kit as easy to carry as we can. 2. Stock any prescription medications you may need. Usually, even on highly regulated medications, you can refill your prescription a day or two before you actually run out. Or use a mail prescription service to order multiple months at once, and glean a few days from that supply for your kit. Try to get a three-day supply of your medications put away, then slowly build that supply to a week or more. 3. Remember the youngsters. If you have small children you’re preparing for, you may need to stock the junior versions of medications as well as the adult versions. 4. Personalize your kit. It’s okay to start with an off-the-shelf first aid kit, but look through the contents and add the things you regularly use. If you use a lot of a particular OTC medication, make sure it’s in your kit. Do not stock medications for which you have allergies or sensitivities. Unless you only plan to use them for someone else. Pack medical supplies you know how to use and are comfortable with. 5. If essential oils are your thing, by all means add them to your kit, but try to get the tiny travel bottles for them–the larger bottles can add a lot of weight. 6. Don’t forget the hand sanitizer. No need to make a bad situation worse by inviting infection treating injuries with unclean hands. 7. You don’t need to keep medications in their original containers, but you DO want to have the dosing information, lot number, and expiration date. I put a variety of over the counter medications in baggies and write the information on the baggie with a permanent marker. You could also print the information on a piece of paper to include in the bag or a label. This method makes it so you can carry more types of medications in a smaller space without losing the important information off them. 8. Check your medical supplies every time you rotate the contents of your kit (recommended at least once a year) and replace medications that are near expiration or products like bandages whose sterile packaging may have become compromised. 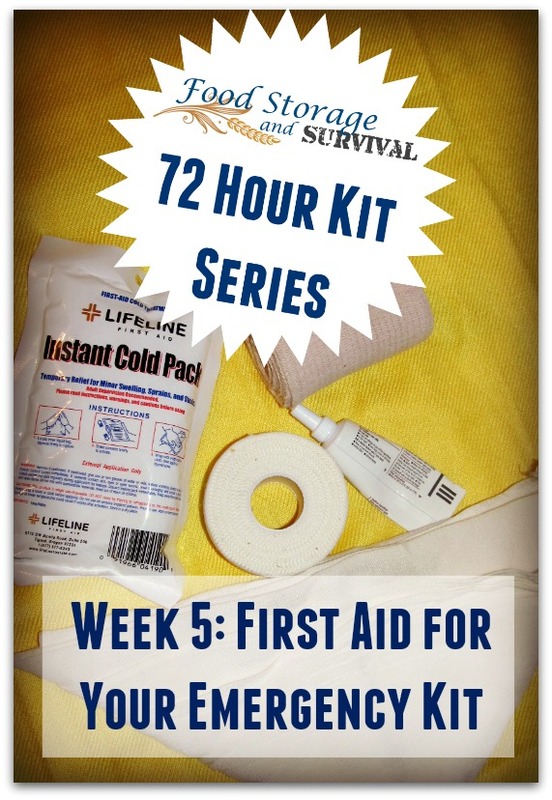 So what should you have in your 72 hour kit first aid supplies? Following is a generic list to get you started. 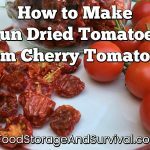 Remember, this is a pared down list to keep in your portable emergency kit so it’s just the basics. I’ll say it again–PERSONALIZE your kit. Antibiotic ointment. If you don’t want to carry a full tube, get the individual packets or make your own packets using a drinking straw. And yes, I’ll spell it all out for you in a video as well so you can see what’s in my kit. What else do you have in your first aid kit? Let me know in the comments! I have a wound flush syringe a small pair of scissors and tweezers. I also keep a laminated recipe card that has instructions for making Dakin’s solution for wound cleansing plus a capped squeeze bottle to put it in and act as a wound flush, precision tweezers and a couple of standard hemostats and one needle driver and thread, as well as curved needles which can be bought where upholstery supplies are sold. Cotton balls. A stethoscope and BP cuff is also included, and I can palpate a blood pressure without a sphygmomanometer. Yes, I’m an R.N. I pack bandaging materials in Food Saver bags, and my scissors are included my Swiss Army pocket knife, although I have a really decent small pair in my sewing kit also (Fiskars blunt nose scissors for children). Pain relievers include aspirin to use as an emergency clot buster. I made a zipped square “train case” type of bag with a red cross adorning the top and a carrying handle for my 1st aid kit. I intend to fill some 2 or 3 oz. travel bottles (ones with popup spouts on their lids) with rubbing alcohol.